contains green tea, known to increase energy output and fat oxidation. The body converts food into energy and nutrients, storing as fat any energy not needed for immediate use. We are thus programmed to put on weight when we take in more food than our bodies can use. ¤ The ideal solution is to increase our energy expenditure, or reduce the amount of food we consume, but it’s not that simple, since hunger and the desire to eat are governed by numerous factors including our hormones, which are difficult to control. ¤ New Appetite Control Formula has removed a controversial ingredient (DMAA) and introduced a new approach, enabling the impulse to overeat to be tamed, and the appetite to be curbed and regulated. ¤ Phospholean® is a proprietary, new generation, phosphobioflavonic complex. It combines oleoyl ethanolamine (OEA) and epigallocatechin gallate (EGCG) from green tea, bound to a phospholipid to ensure their breakdown in the small intestine where appetite-controlling receptors are found. Phospholean® has been shown to be very effective in an 8-week study conducted on 138 overweight or obese subjects. Those taking Phospholean® were more able to adhere to their diets and their weight loss was 33% higher than that of the placebo group. In addition, researchers observed greater insulin resistance, fewer depressive conditions and increased feelings of satiety in the supplemented group. ¤ Slimaluma™ is a proprietary, standardised extract of Caralluma fimbriata, a plant used for centuries in India to help suppress hunger and survive famine. Free from toxicity, Slimaluma™ promotes weight loss, acting on levels of leptin, a hormone involved in balancing food intake and energy expenditure. Double-blind studies conducted in India and California have both confirmed its beneficial effects on reducing weight, waist circumference and body fat and preserving muscle mass. ¤ 5-Hydroxy Tryptophan (5-HTP) is extracted from the African plant Griffonia simplicifolia. 5-HTP is the most immediate precursor of the inhibitory neurotransmitter serotonin, which acts on the nervous system as an anti-depressant, improves sleep and helps control and curb appetite. Due to its appetite-controlling effects, it has been successfully utilised in slimming programmes as a natural hunger-suppressant; these effects are felt after a week to 10 days’ regular use. Other slimming formulations may also be of interest for accelerating weight loss. Crominex 3+, for example, is a chromium supplement which can help decrease fat mass while maintaining lean muscle mass, while the probiotic strain Lactobacillus gasseri, is known for its weight management benefits. 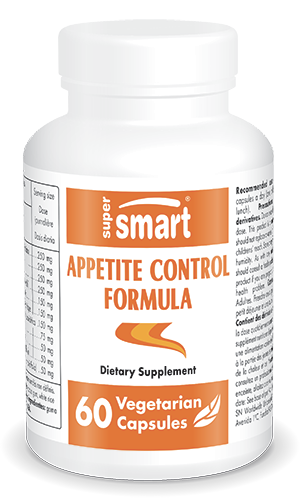 Appetite Control Formula combines three non-stimulant ingredients with proven efficacy to help control hunger and make it easier to adhere to the diets necessary for weight loss. Adults. Take two capsules a day (one at breakfast and one at lunch).